The resumption of curbside glass recycling after a two-year pause is made possible by the city’s new recycling contractor, Fomento de Construcciones y Contratas, Inc. (FCC), which built the recycling facility in northeast Houston. In 2018, Houston City Council selected FCC after considering several proposals from competing recycling companies. The FCC agreement saves taxpayers millions in recycling costs and expands the type of materials the City's Solid Waste Department can collect curbside. Glass, along with other items accepted in the recycling cart - paper, cardboard, aluminum, tin cans and plastics -- should be clean, dry and empty before recycling. The FCC facility opened in March and has a 145,000 ton per year capacity, which is more than double the current needs of the City. For non-curbside customers, glass continues to be accepted at the City’s Recycling Drop-Off Centers listed below. The City’s partnership with FCC also represents a reduction in the cost of Houston’s recycling program. The new contract shares the financial risk between the City and FCC, so that the City can limit its liability when the value of recyclables declines and share in revenue when it rises. The entire facility and plant ownership are transferred to the City; however, FCC will be responsible for operations and maintenance and the liability of the entire plant for the duration of the contract. During the course of negotiations, the city worked hard to come to an agreement for Houston that at no time will the cost per a ton of recycled material exceed the cost per a ton of disposal to the landfill. 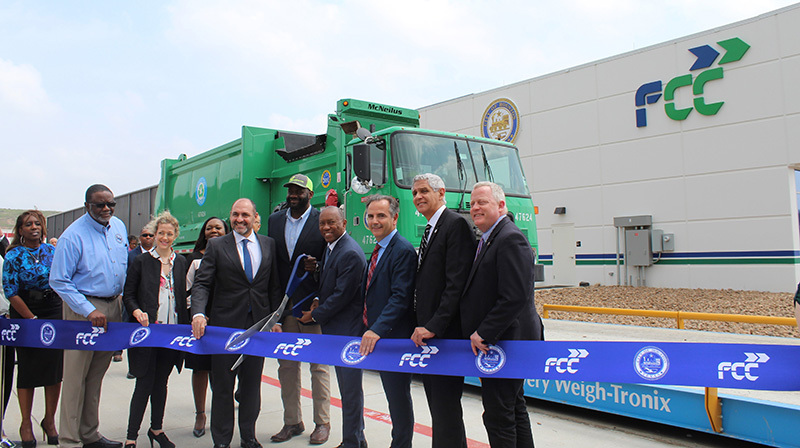 Mayor Turner said the City and FCC look forward to working together to grow our recycling program - improving the quality of the material, preserving our valuable landfill space, and protecting Houston’s environment for the long term. The overall goal for involvement in the plant project by minority-owned businesses, women-owned businesses and small business was 11%. FCC reached 100% for design work and 33% on the construction phase. Mayor Turner announced FCC will provide job opportunities for “second chance” and homeless residents. Half of the workers on the sorting staff are in the second chance category.